You can set your hygge bar (standard), by purchasing some happy things you love and would happily hug forever. They say (the “voice of the world” says), money can’t buy happiness, but I say it CAN buy goodness: good blank pages to your hygge book, the scenario for good conversations to come, memories. And some of this happy things happen to be part of a brand called HAY. Danish brands spreading hygge over the world are building paths to agreements, a common ground that is peaceful and sets an example of what I dream will happen one day at other levels. It is a culture of objects that responds to humanity. Their families of products are extremely coherent, even when being developed by studios located not only in Denmark and not all under the same roof. They relate to each other on the clear and honest arguments for their existence- like they won a place, they deserve to exist. That they collaborate with designers around the world is just pure brilliant- spotting not only good professionals but genuinely good people with a fun and responsible approach to design. And I love the originality of all of it- original as in, referring to origins that are local but also intelligible globally, a language worth bringing to life, timeless, life that was always there, function, aesthetics, craft, and luck, reinterpreted into something wonderful. HAY is an invitation to intimacy. It is the result that comes from allowing each one of the designers invited to the work-fun table, to relate to materials in their own way- to answer their own interior questions. Their answers are always simple and extraordinary, intimate but current. They feel like a gift to design and to everyone. They are global. So I am fan. I save to get little HAY things. And I love them. I have an old Hay sofa that I got on the blue paper (equivalent to gumtree in Australia), and I found it by using my magic key words: Hay and Hallingdal. Hallingdal is a fabric by Kvadrat (another Danish brand). You can touch their little fabric samples in their showroom, right here in Aarhus! I walk past the store to get inspired, touch things. It is no Steve Jobs, no Google radical twists. This, that I want to share with you today, is a candle holder- called MOMENT, designed by Lars Beller Fjetland and produced as part of Hay’s collaborative range created with British designer Sebastian Wrong. It might not change the world but it will make you smile. How good, how very much Hygge would it feel to have the company of a candle friend, your buddy candle, that is also accompanied by his helper, his own buddy extinguisher. 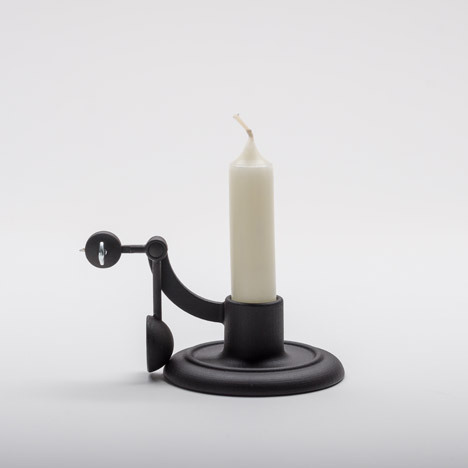 Moment is a candle holder that will surprise you maybe, with absolute precision. His promise is to catch the exact moment when your relationship ended, you and your candle, tragically beautiful. That was that. The suspense and tragedy that follows memories summed up in a candle holder. An old 1850 idea is back to life and it makes sense. We need a candle extinguisher. We need hygge. We need a love ceremony. The device features a pendulum with a needle on the end, which is inserted into one side of the wax close to the bottom of the candle. “This simple mechanism is powered by the stored momentum of the adjustable weight that rests on the very tip of the moveable arm,” said Beller Fjetland. Beller Fjetland came up with the idea for the design during a visit to a museum in Oslo, where he found a collection of 19th-century candelabra. Next articleRandom thoughts that lead to theories of everythingReconciling with my friend Luck in the name of love (finding a house in Aarhus). Here, a list of what a housing pep talk looks like and one thing to do.